Supply Management was ordered to develop a better formula for pricing of their essential food products (dairy, chicken, turkey, & eggs). What we got was bureaucratic, impenetrable & confusing smoke and mirrors. The old system for chicken was based on the farmer's price of buying chicks and chicken feed, plus a "reasonable" amount for the farmer's labor, overhead expenses, and capital costs. Sounds reasonable, easy to understand, and possibly justifiable. Unfortunately, the #ChickenMafia and their friends floated mirages and artificial prices for each of these pricing formula factors, putting in the fix to maximize the #ChickenMafia's profits. This system of smoke and mirrors allowed the #ChickenMafia farmers to become the highest paid farmers in Canada, 21.1% higher than the median farmer's income (see Blog posting Tail Wagging The Dog ). How did the #ChickenMafia distort a simple pricing formula to their weapon of choice for gouging the Canadian public? Many family farms have been bought, merged and amalgamated into the fold of Big Ag. multi-national billionaire corporations. Many other chicken farmers have become Big Ag's puppets. Big Ag. and their feed mills own or influence the chick hatcheries, the chicken feed producers, the chicken farmers who grow the chicken to full size, the abattoirs who slaughter and process the chickens, and distribute them to the grocery stores. That web of control and influence is called vertical integration. That vertical integration creates a very powerful force, one that is hidden from public view, and beyond government control, supervision, or oversight. Barrie McKenna at The Globe & Mail described the struggle over the ammeding this sneaky, stealth control of the chicken pricing formula by the #ChickenMafia. These 8 factors all add up to 100% of the weighting. At least they got that right, we now have proof positive they know how to add and do percentages. The rest is in doubt. Under the 2001 Federal-Provincial Agreement for Chicken, allocation of quota amongst provinces is supposed to be based on lowest cost producer. This help ensures consumers get less expensive chicken, rather than subsidizing inefficient producers. Will the new MOU ensure this occurs? I doubt it. The advantages of CFC's system is this MOU defines how all the provinces will jockey and fight amongst themselves. At least that is a battle somewhat among equals. Fortunately, the innocent and helpless consumers are proected from these vicious Supply Management Monsters when the MOU is implemented each quoota period. Agri007 describes the MOU and its 8 factors, and doubts it will achieve something in the consumer's best interest. The deck of cards is stacked against the consumer. All the aces are secretly tucked up the sleeveof the #ChickenMafia. The #ChickenMafia then makes a big media blitz and promotion that they are re-shuffling the deck of cards, and dealing a fresh hand to all players. Some people might be fooled to enter their anty, trust the new dealer, and try one more time with eternal hope for a better tomorrow for Canadian consumers. Unfortunately, no matter how many times or how well the deck is shuffled and cut, you need to realize that the aces are up the sleeve of the #ChickenMafia. Those aces will be re-introduced to the game with great stealth at just the right time. The consumer has no chance to win. COOL (Country Of Origination Labeling) has been a hot issue for Canadian pork being exported to the US. What about chicken? Consumers, both in US and Canada (and I assume the rest of the world), would like to know where their food comes from. With the 100 mile diet, eat local, buy local, and xenophobia, there is considerable pressure to buy from local producers. That is why Canadian pork producers object to having "Raised in Canada" being put on Canadian pork that is sold in US grocery stores. Everybody realizes that would be the kiss of death for sales. The meat will rot on grocery store shelves, rejected by US consumers. Alternatively, US grocery stores would have to sell Canadian pork at deep discount pricing, so low it would drive Canadian pork exporters into bankruptcy. Is this issue isolated to just Canadian pork? No. It also applies to both Canadian and US chicken. China has been frozen out of many industries, but they want greater access to US markets for all of their products, including food. US Food and Drug Administration ("FDA") has their hands full with lousy chicken quality produced by US growers, US abattoirs, and US processors. They don't need the added risk and headaches from sketchy Chinese poultry producers. If Chinese dairy producers were willing to adulterate milk and baby formula with toxic melamine, or thousands of dead pigs purposefully dumped into Chinese rivers, what would you expect to occur if they could export Chinese chicken to the US? But the Chinese kept pushing their agenda. Finally a compromise was reached. IN Sept. 2013, Economy In Crisis Blog reported with outrage that Chinese abattoirs would be allowed to buy US grown chickens, eviscerate them, cook the meat, package it, and export it back to the US for sale in US grocery stores. The package would say "Made In USA", likely due to COOL regulations. That would allow retailers to hock this US chicken processed in China as 100% bona fide Star Spangled Banner home grown chicken to an unsuspecting public. US farmers were likely in favor as it gave them additional production, and the Chinese buyers would likely pay a premium to get the necessary chicken supply. As an interesting sidebar, FDA only has sufficient resources to inspect 2% of the imported chicken. In the US, 60% of imported food comes from developing nations. It isn't just snooty and fancy mustards from France that are being imported into the US. Just like in Canada, when half century old canning factories in Canada are shut down so that we can buy pickles imported from India. USDA inspectors regularly come to Canada to make sure Canadian foot exporters and CFIA are both doing their job of ensuring safe food is being exported to the US. However, there are no plans for USDA inspectors to ensure the quality or safety of this chicken processed in China. Should Canadians jump on this opportunity, saying "Americans are spooked by Chinese chicken. We believe American would be much more comfortable with US chickens processed in Canada then re-exported back to the US. Canadians will build the extra slaughter capacity that's necessary to meet this marketing and exporting opportunity. Would Canadians be ready to unknowingly accept Canadian chicken that was processed in China, but the retail meat counter label on the packages hides that fact? For all we know, CFIA may have already cut that deal with China and its exporting allies. Where does this place Small Flockers within this boiling kettle of politics and chicken broth? How is it cheaper and better to ship chicken all the way around the globe before humans eat it? Obviously this well traveled chicken will only occur if someone is making more money doing things the crazy way. Can we not find a solution that will allow the underutilized Small Flockers to spread their wings and fly? Here is my plan for myself and my community until we can get the abusive Supply Management regulations changed, declared illegal, or unconstitutional. On my farm, I continue to raise my 99 laying chickens, and provide fresh, ungraded farm eggs to my community every day. I still have my 1 (one) meat chicken as a token bird, so that I meet on an ongoing basis the definition of a chicken farmer. This enable me to complain about the actions of Chicken Farmers of Ontario ("CFO") while my wife and I eat our way through our freezer full of our previous meat birds I produced but were unable to sell under current Small Flock Regulations. I also have ducks, geese, turkeys, goats, and livestock guardian dogs. I have filed a request for reconsideration of the OMAFRA Tribunal's decision on my appeal against Chicken Farmers of Ontario ("CFO"). Asking the fox to reconsider his decision to eat one of my chickens has little chance of success, but it is a mandatory step in the long, twisted bureaucratic process of Supply Management. Under CFO's Small Flock Regulation No. 2484-2014, Section 1. (j) states a Small Flock Grower is a person, and each person can grow 300 birds per year. Under Ontario law, corporations are persons, equal to flesh and blood persons. I attended the recent seminar sponsored by Practical Farmers of Ontario , and heard Joel Salatin of Polyface Farms speak. Using mobile facilities as recommended by him, I can move my entire free range meat bird operation in an afternoon from one lot to another if I need to. Therefore I'm making plans to rent (via 2 separate companies) 2 small patches of agricultural land from other farmers/owners, and those companies will have exclusive first rights to raise chickens on those farm lots. With my own farm, that will give me 3 separate lots. With 3 farm lots at 300 birds per lot, is 900 meat birds in total; totally in compliance under the current Supply Management rules for Small Flocks. These 900 meat birds will nicely serve the needs for safe, nutritious, affordable, and locally produced chicken in my local community. Unfortunately, Section 21 of the Reg. says CFO can change the Small Flock Regulation any time they please. I am confident that CFO will harass me and others who dare to try this plan, or CFO will invent crazy definitions and twist the interpretation of their Small Flock Regulation so as to make my plan be prohibited, or arbitrarily and unilaterally change the CFO Regulation so that my plan is expressly banned. You might conclude that I do not have much faith or trust in CFO. CFO has a valuable monopoly to protect. CFO's members are all multi-millionaires, but they wish to become billionaires. Many of CFO members have slowly become trapped puppets who are controlled by Big Ag. Therefore CFO will likely do anything necessary to protect their monopoly, and achieve the goals of their members and Big Ag. I believe CFO intends to continue violating the civil rights of small flock farmers, and using CFO's monopoly as a weapon against consumers. If there are other like minded persons who want to help implement this interim plan, or work co-operatively to prepare for CFO's retaliatory strike against all those who consider implementing this plan, please leave your comments, or contact me in private. The highly contagious H5N8 Bird Influenza has been found at a chicken egg factory farm near Henkendorp, Holland. Dutch authorities have quarantined a 10 km radius; nothing chicken related allowed to come in, or go out. They know this could be serious. How do we know it's a CAFO (Concentrated Animal Feeding Operation)? Dutch authorities will soon be slaughtering 150,000 chickens who reside at that farm for egg production. Realize that these 150,000 bird likely have all the same genetics, so they are similar to being genetic clones of each other. Usually, factory chicken have the same parents, same grandparents, and same great grandparents. They are all hatched the same, fed the same, and treated the same. In other words, there is no difference between any of these birds. That's how CAFO operations work. The birds all grow at the same rate, and produce the same size eggs, at the same rate, with no variability. As long as everything goes perfectly, you maximize profits. If something goes wrong, it quickly becomes a total disaster. "The various strains of bird flu regularly cause panic - which is perhaps justified because the [human] mortality rate is 70 percent." These viruses are constantly mutating. Some, like H5N1 and H5N8 are not easily spread to humans. Other H5 virus strains, including all future strains, have the potential to be transmitted much more easily to humans. When that happens, avian flu will quickly become far worse than Ebola. The longer we delay solving the CAFO issues, the more virus mutations that occur, and the higher the risk that the transmission to humans goes exponential. Sooner or later, we will wish we had reacted sooner. Likely, the CAFO factory farmer will be financially compensated by the Dutch government. In that way, that CAFO farmer (and all other factory farmers just like him) is encouraged to do the same risky behaviour all over again. The factory farmer gets the huge profits when everything goes right. The public picks up the tab when things go bad. The public is exposed to the significant risk of disease outbreak or financial insurance and moral hazard that supports and encourages this risky behaviour. Canada's chicken factory farms are up to the same tricks too. It is only a matter of time before this same or similar risk hits Canada once again. In 2004, avian flu resulted in the destruction of 17 million chickens, turkeys, ducks, and geese in Canada. The House of Commons Agriculture Committee eventually got involved with the botched handling of that outbreak by the powerful Supply Management lobby and their friends at CFIA. Again in 2009, H5 strain of bird flu struck at Abbotsford BC at a chicken CAFO with 50,000 birds initially. The cull eventually spread like wildfire as CFIA tried to contain the outbreak. The CAFO system is flawed. The sooner Supply Management admits it, the sooner we can move forward to something that is safer and better for all. There 'aughta be a law. Chicken Farmers of Ontario ("CFO") and Chicken Farmers of Canada ("CFC") now have the data from quota-based farmers on their use of antibiotics in their chicken growing operations. Will they disclose this information to the public? "As of June 30th , more than 150 surveys have been completed on Ontario farms"
That data can be quickly summarized so everybody can see the qualitative and quantitative scope of the antibiotic issues in Ontario. If necessary, the data can be presented in an aggregated, anonymous form, protecting individual farmers from scorn or blowback from customers, neighbours, fellow farmers, or the public. Until proven otherwise, I assume there is some extreme examples that will shock and upset most people. Antibiotic and chemical use has been a "Wild Wild West" scenario for more than 60 years, so the naturally occurring diversity will astound most people. This diversity is compounded by the right of any farmer to import almost any wild and crazy jungle juice, chemical, or additive under the "personal use" exemption. I don't understand how growing food for an unsuspecting public can be classified as "personal use", but that seems to be what has been occurring. While the data on Class I (critical & most important to human health) to Class IV (somewhat important to human health) antibiotics is available, CFO makes no mention of all the other secret sauces, chemicals, and potions that have been used in the past, and are likely still being used. For example, organic arsenic, antihistamines, Prozac-like anti-depressants, caffeine, and Tylenol-like pain analgesics, and many other chemical and neutriceuticals have been fed to chickens in the US, and likely similarly in Canada for decades (see Blog posting Choose: Frankenstein Chicken, or Naturally Raised Chicken?). Will CFO and CFC next find out and disclose what is being fed to these birds so we all know what's in our food? How does CFO and CFC think a trusting relationship can be established (or continued) when one party refuses to disclose critical information to those most affected? Based on what I have seen in the past, I doubt CFO or CFC will disclose anything until the are ordered to do so by the government. Until the government acts, consumers will continue to slowly wake up, sense the abuse and untrustworthy actions of CFO and CFC, and consumers will seek out other suppliers who demonstrate their trustworthyness in a verifiable manner. None of this will end well for the #ChickenMafia. The Canadian retail prices for meat have entered a mania phase. How will Canadians react when more and more of us are forced to become vegetarians by unaffordable meat prices? 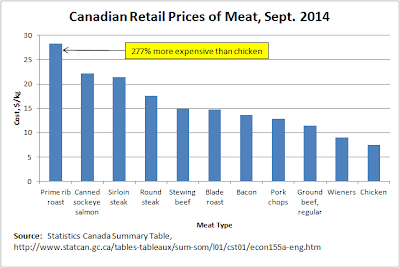 Figure 1 shows data from Statistics Canada on the retail price of meat in Sept. 2014. Click on the graph for a bigger version. As expected, prime rib of beef is the most expensive. I am pleased to see chicken is still the cheapest on a $/kg basis. Note that prime rib is 277% more expensive than chicken. CAFO (Concentrated Animal Feed Operation) has the biggest market share for beef, is usually the cheapest method of producing beef, and has an FCR (Feed Conversion Ratio) of around 5, while Ontario chicken has an FCR of around 1.72. If all other factors are similar, the cost of feed is the biggest factor in determining the price of meat. Therefore beef should be 290% higher priced than chicken, but is actually just 277% higher. Does this mean that beef is 4.7% too expensive, or chicken is 4.7% cheaper than it should be, or a combination of the two? I think it's safe to assume that the prices are reasonably close to the correct ratio; but both beef and chicken need to be deflating in price, not inflating. 16.1% from 2010 to 2014. Figure 2 above shows the trends in Canadian meat prices for 2010 to 2014. 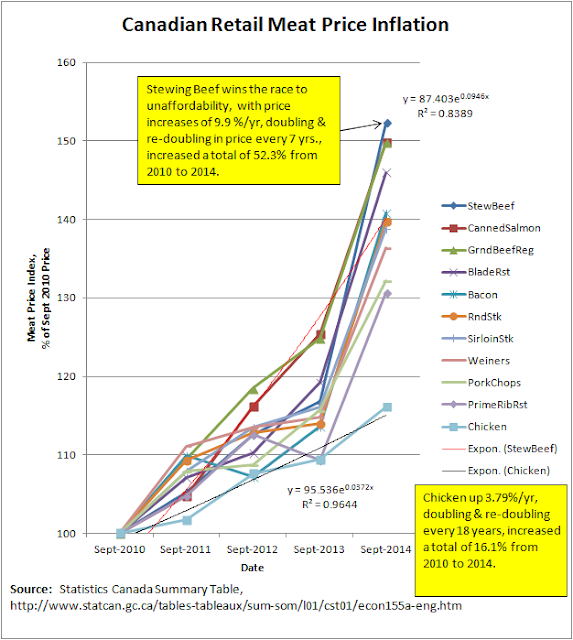 Stewing beef wins the race towards unaffordability with a 9.9%/yr increase, doubling and re-doubling every 7 years, with a total increase of 52.3% in price from 2010 to 2014. Chicken prices are up 3.79% per year, doubling every 18 years, with a total increase of 16.1% from 2010 to 2014. I wish to congratulate the Canadian chicken industry for resisting the natural urge to jack up prices like the other meat industries did in 2013-2014. See, I can offer the #ChickenMafia a heart-felt complement when they deserve it. 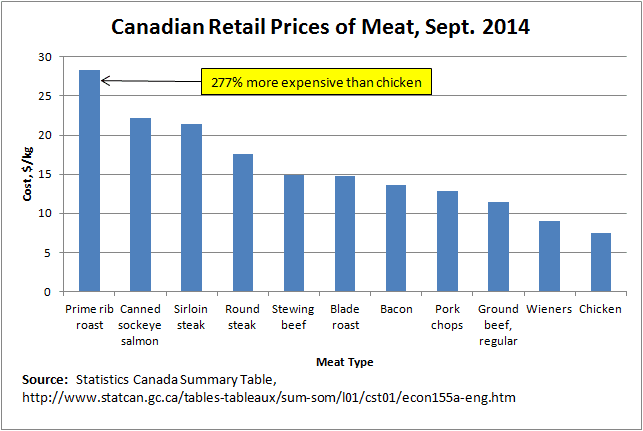 It is interesting that, except for chicken, the cheapest meat cuts have the highest rate of price inflation. As meat prices go up, more and more people will naturally gravitate towards the cheaper cuts of meat. As stewing beef flies off the store shelves, the available supply of stewing beef drops. Stewing beef is usually the trims cut off the higher priced cuts of beef during the butchering process. When that is all gone, butchers can start cutting up prime cuts of meat to make stewing beef (highly unlikely), or sell out and have a bare meat counter with no stewing beef for sale, or they can raise the price of stewing beef to balance supply & demand. Beef and pork were both suffering severe struggles on the farm in 2013-2014 due to the PED virus for pork, and the severe US drought in Texas and California. Are these being used as excuses (or are just and reasonable reasons) for these extreme price increases? Even weiners, mostly made from pork and chicken, jumped on the price inflation bandwagon in 2014. However, chicken resisted the price inflation trend set by everybody else. Did this Blog and its whiny voice have any influence in the #ChickenMafia's decision? I doubt that. It appears that the #ChickenMafia has determined that flying below the radar is in their long term best interest. Large price swings tend to incur the attention and anger of the public, and that is when Supply Management might add the straw that breaks the back of SM's camel. Instead, #ChickenMafia continues their policy of a "steady as she goes" inflation of 3.79% year over year, like clockwork. Let the sleeping public stay asleep. It appears the #ChickenMafia's strategy is working pretty well for them. Hopefully, Supply Management can be changed so that the #ChickenMafia have a "steady as she goes" price reduction each and every year, requiring them to work very hard each year to find more and more methods to improve their efficiency and productivity, thereby lowering prices like clockwork. In that way, the #ChickenMafia become excellent stewards for the public, using their government created monopoly to serve both stakeholders (ie. themselves, as well as the greater good of the public). 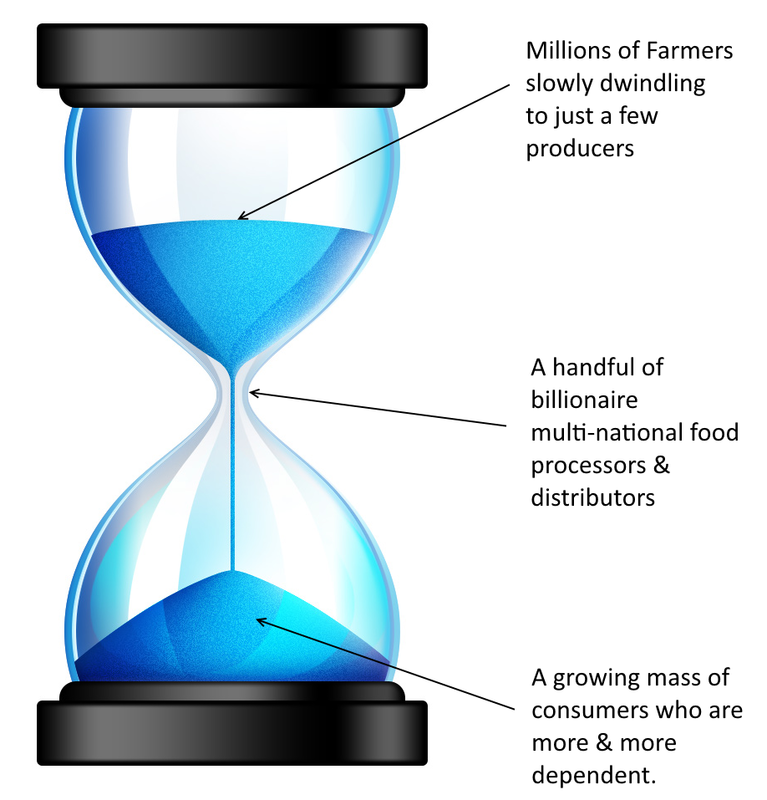 An anonymous poster on Better Farming proposes that Canadian food prices for Supply Management ("SM") foods must increase even more and faster so as to ensure production quantities increase so as to feed the growing population. The Law of Supply & Demand would tend to match demand to supply by price adjustments. Also, we tend to use the best resource first (ie. increasing demand will bring less productive farms, farmers, and land into production once all the best resources are fully occupied; see Best First Principle). Less productive resources will tend to require higher prices to keep them engaged. On the basis of just these two isolated factors, this wayward anonymous poster with their many simplifying assumptions is partially right. However, there is the possibility of productivity improvements. For example, I bought an Apple II+ computer in 1979 for about $2,500.00 which was an 8 bit 6502 processor running at 1 MHz with 48 kB of RAM memory and no hard drive, and one 5 1/4" floppy drive, and only rudimentary software. It cost me more than 2 months salary at that time. I was determined to join the digital age, and paid a huge price to do so. A few months ago, I bought a new notebook computer with a 64 bit Intel i5 processor with 2 cores and 4 threads running at 1.8 GHz, 4 MB of ram, 0.5 Terrabyte hard drive, loaded with MS Office professional software etc., for $750.00 This computer is about 4,000 times more powerful than the Apple II+ of the 1970's. The Consumer Price Index ("CPI") was ~35 in 1978 and is ~125 today. That means the $2,500.00 Apple II+ in 1977 is equivalent to $8,928 today (ie. 125/35*$2,500= $8,928). If we assume today's notebook is 4,000 faster & better than the Apple II+ based on the microprocessor speed, cores and threads, then the equivalent price for today's notebook is $35.72 Million if we use hedonics (see http://en.wikipedia.org/wiki/Hedonic_index ) to compare computers of equivalent power (apples vs. apples, not apples vs. oranges). How is it that I bought the new notebook for $750 rather than the equivalent Apple II+ price in 2014 of $35.72 Million? From 1978 to 2014 is 36 years. Assuming a steady rate of CPI inflation over these 36 years, the equivalent Apple II+ computer price would have inflated by 30.44% per year. However, it actually deflated by 3.4% per year. This price differential is because of competition and continuous improvement in the computer industry. Throughout those 36 years from 1978 to 2014, the computer industry faced inflating expectations from raw material suppliers, staff wages, energy, taxes, changing technology and re-investment, and everything else. The various computer companies either improved their operation, or were subject to dying an early death. Apple Computers almost went bankrupt due to numerous mistakes and loss of focus. Many other computer suppliers were unwilling or unable to compete, so they went out of business. Unfortunately, Canada's Supply Management system for chicken, eggs, turkey, & dairy doesn't have to improve, nor compete. They get to charge whatever they like, regularly putting through price increases; price increases for themselves, or by enabling their SM coattail riding "friends" to do so. Canadian consumers are forced to pay these price increases for SM foods. As the rest of the world improves, and suppliers and raw materials increase their prices, SM margins get squeezed, so SM puts through another price increase to Canadian consumers so that SM players are insulated and protected. SM always protects itself, but who insulates and protects Canadian consumers? Nobody! Canadians pay and pay again for SM's growing inefficiencies. For example, Ontario's FCR (Feed Conversion Ratio) is 1.72 but Tegel Poultry in New Zealand has an FCR of just 1.38 or lower (see http://www.wattagnet.com/154106.html ); 24.6% better than Ontario. If SM were to change their focus today, it might take them 2 decades to regain the competitive ground they have lost to the rest of the world during SM's ineffective reign. Until SM changes their ineffective system, Canadians are forced to slowly sink in the SM swamp, unable to be rescued from their terrible fate. CFIB (Canadian Federation of Independent Business) has attempted to bust 4 "myths" with its recent survey of CFIB members who are in the agriculture sector with their 2014 State of Canadian Agriculture Survey. Did they achieve their purpose? CFIB states that the public (and possibly many farmers) have the strong impression of problems in agriculture (or significant opportunities, depending on your outlook). The agriculture sector is shrinking. Farming is unsustainable and potentially environmentally harmful. Farming is moving away from family businesses toward corporate operations. I would agree that many Canadians, if not the majority, hold these impressions. Even those who are directly working in agriculture, or serve the agriculture industry indirectly, seem to have these concerns. CFIB offer some survey results to try and bust what CFIB calls these "myths about Canadian agriculture". CFIB asked some very broad and general questions, which in some ways, lead the survey participants to create a positive spin on the survey results. In that regard, I can't agree that the survey was well constructed, nor balanced, nor objective. Obviously, CFIB has conducted this survey for their own purposes, as well as those of the members surveyed. The survey seems to reinforce CFIB's talking points and lobbying efforts, which is most likely the primary point and purpose of the CFIB survey. For example, CFIB says that 81% of agri-businesses use the Internet for obtaining "information, products and/or services". Based on the survey, we don't know whether this Internet access occurs from their own home, or their agri-business offices, or the public library, or their kid's house in the city. Statistics Canada says that 83% of Canadians have access to Internet in their homes as of 2012. We therefore conclude that farmers surveyed are at least 2% behind the Canadian average. This may be within the accuracy of the survey, but certainly is not a ringing endorsement that proves Canada has world-class, tech-savvy ag. businesses. CFIB appears to have gone way beyond the data by generous assumptions. "We invest in leadership training, we pursue new or improved product lines through R&D initiatives, we commissioned surveys into emerging market trends to support our customers’ development of their business. We are building sales into the Omega 3 market but it is very costly relative to short term payback." The other comments might be from the poultry sector, but it is impossible to tell for sure. While the above comment sound good, is it proof positive that clearly busts any or all of the alleged myths of agriculture? I think CFIB has again stretched the survey data way beyond the breaking point. Perhaps the Supply Management sectors can take this as a challenge, to construct a balanced, unbiased survey of their members, then publish ALL of the results so we can all know for sure. Obviously, there will be areas that can be improved. These local boards can then set their strategic plans and publish them in the open. Everybody (government, members, small flockers, and consumers) can then fully understand the issues, the current status, and plans to improve. Note that surveys can be constructed so as to make it difficult to impossible to get negative outcomes in the results. I wouldn't call that a balanced, unbiased survey. Garbage questions create garbage survey results. Later, when a follow-up survey is conducted and published the following year, we can see the plan vs. actual, why the shortfalls occurred, and what they are going to do to close those gaps. On-site audits by independent auditors can be done at random farm survey locations to determine how skewed the true results are, as compared to what the farmer wrote on their survey form. Then we know what the farmer thinks (or wants others to think), and what is really going on. That's powerful data! That is what accountability with the public's money and power is all about. I forecast that as long as Supply Management is allowed to exist in its current form, there is higher likelihood of snow blizzards occurring on the Moon. In other words, it will never happen under the current regime. That's why this Blog exists, and will continue to advocate for substantial change in Supply Management. When all goes well, factory farms might be the low cost producer. However, what happens when things go badly, as they often do? What then? somebody steps in and changes the system. Who will make the necessary changes, and when will they start? There is no substitute for boot on the ground. Small farms owned & taken care of by dedicated people who will stop at nothing when bad goes to worse, have an advantage in troubled times. For example, one farmer has 10,000 acres under his ownership and/or rental. When the weather is good, and the super efficient (and super expensive) farm machinery works well, that one farmer and his regular helpers can easily achieve what needs to be done. However, we see the risks better this year. The window is quickly closing in this very wet Fall. Thousands of acres of corn, oats, soybeans might soon be rotting in the field if the weather refuses to co-operate. Climate Change makes for less predictable weather. If bad weather hits, the neighbour is likely similarly at risk, and therefore has his hands full too at exactly the same time, and is unlikely available to help. Changing climate also raises the possibility of viruses and bacteria attacking and quickly spreading through the flock. What farmer is adequately staffed to handle a sudden outbreak with huge mortality levels? Who is willing to wade into a known outbreak as a neighbour helping neighbour, and possibly transport that disease back to his home farm? It is government's role to set proper policy. Does government not recognize the risk associated with putting all the eggs into just a few baskets. No matter how carefully you watch those few baskets, there are things beyond anybody's control, accidents happen, mistakes are made, and we end up with a huge unmitigated disaster for which we all pay. Some farmers are willing to take these risks, for in good times they make a fortune, and in bad times there is government sponsored insurance. The question is whether it's good government policy to encourage those who speculate and gamble with other people's money (ie. taxpayer's money). The farm size and risk pendulum has swung way too far under Supply Management and agriculture in general.